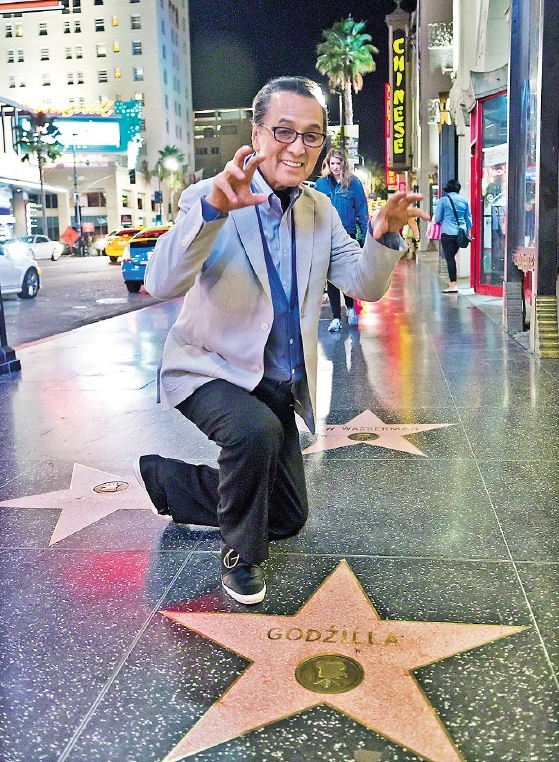 Quite a bit has changed over the last 50 years, since Japanese actor Akira Takarada’s last visit to Southern California. Accompanied by his son, Tetsuya, Takarada had quite a bit to see in the short time he had before making his first West Coast appearance in decades. He was in Burbank as a headlining attraction for the Son of Monsterpalooza convention, held Oct. 11-13. Takarada’s tour included the sights of Glendale, Hollywood, and Little Tokyo—where his adoring fans immediately recognized him. “I had no idea that I had so many fans in America,” he said with pride. Some of the fans attending the convention shared that they had traveled from as far as Texas to attend the convention and stood in line for hours to meet Takarada. The star also visited with Japanese Consul General Jun Niimi, Consul/Director Takehiko Wajima, and Consul Toshiaki Nakatani at the consulate in Downtown L.A.
Takarada also paid a visit to Masaki Fujiwara at the Century City branch of Toho Co., the studio that first brought Godzilla to the screen. Wherever he went, people admitted to being longtime fans of Takarada’s work over the past several decades. Born in 1934, Takarada’s acting career started when he joined Toho’s “New Face” program at the age of 19. His impressive career spans many years and numerous roles in films, TV series, stage productions, and commercials. To American audiences, he is best known for his role as Hideto Ogata alongside actor Takashi Shimura (star of Kurosawa’s “Seven Samurai”) in Toho’s 1954 milestone “Gojira” (“Godzilla”), directed by Ishiro Honda. Takarada continued to act in several Toho productions, including Hiroshi Inagaki’s “Chushingura” (1962) and in different roles from the Godzilla series, including “Godzilla: Final Wars” in 2004. Takarada will join the cast of Warner Bros. Pictures and Legendary Pictures’ new production of “Godzilla,” which will be a reboot closer to the 1954 original. Toho Studios will oversee the project as British film director Gareth Edwards — known for writing and directing 2010’s “Monsters” — tackles a script written by Max Borenstein, David Callaham, Frank Darabont and David S. Goyer. Takarada will work alongside Ken Watanabe, Bryan Cranston, Juliette Binoche, David Strathairn and other well-known actors in this long-awaited film, set for release in May 2014.